Amazing discounts in time for the holidays! Come and visit us in store or contact us for further details! with footprints and water drops. that would soon be there. On, masks and good air! From the fins to the shirts on top of the rack! that will warm your back! stuffers can be wisked away! To make your next dive not work but all play! ​For many, the holidays are exciting; an amazing way to spend time with loved ones. For others, it's stressful. What do you buy for this person, what about that person. The commercialism is overwhelming, in a society obsessed with "stuff", we here at Rockfish Divers believe that maybe the future should be less about "stuff", and more about experiencing life outside of smart phones. 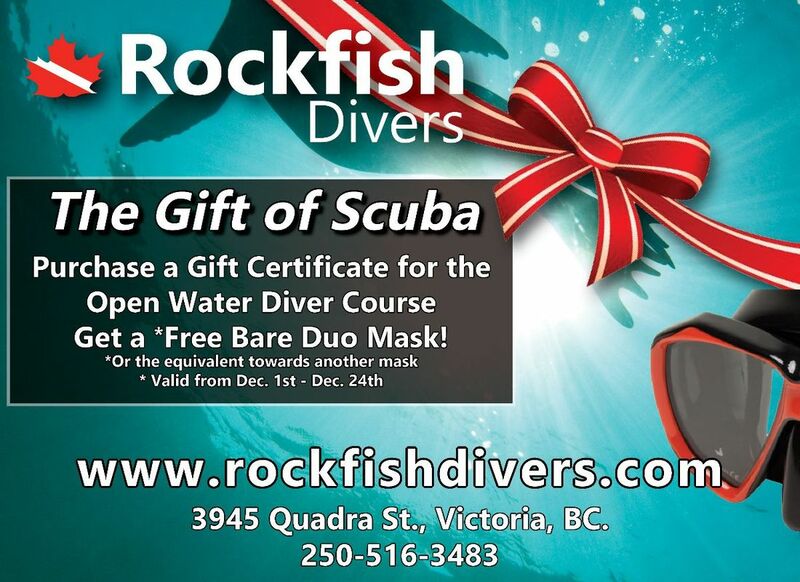 Scuba lessons are the gift that keep on giving. They provide loved ones the opportunity to build confidence by doing something new and exciting, you meet new people, get connected with nature and see some of the most amazing wild creatures in their natural habitat. Someone who has not been diving for a few years. Someone who has not experienced cold water, and a drysuit training is in order.